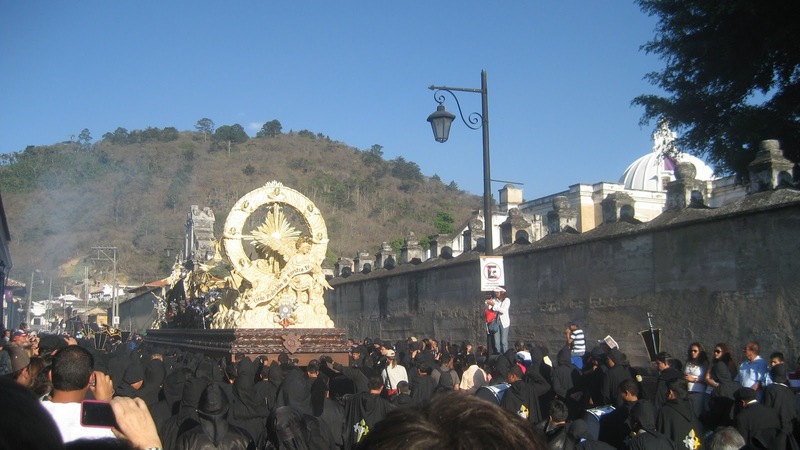 Good Friday is when the fervor of Semana Santa peaks in Antigua. The day is packed with death, death, death. 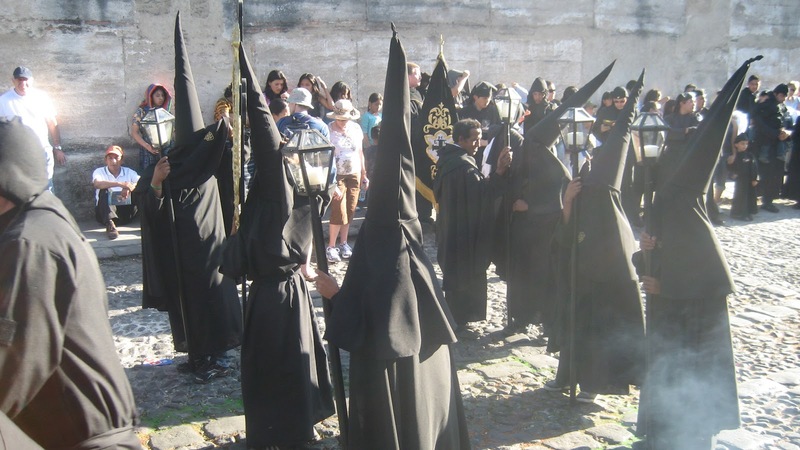 The Lenten purple robes have turned to black with the death of Jesus Christ and the mood is severe and somber. People walking along side the processions cry. 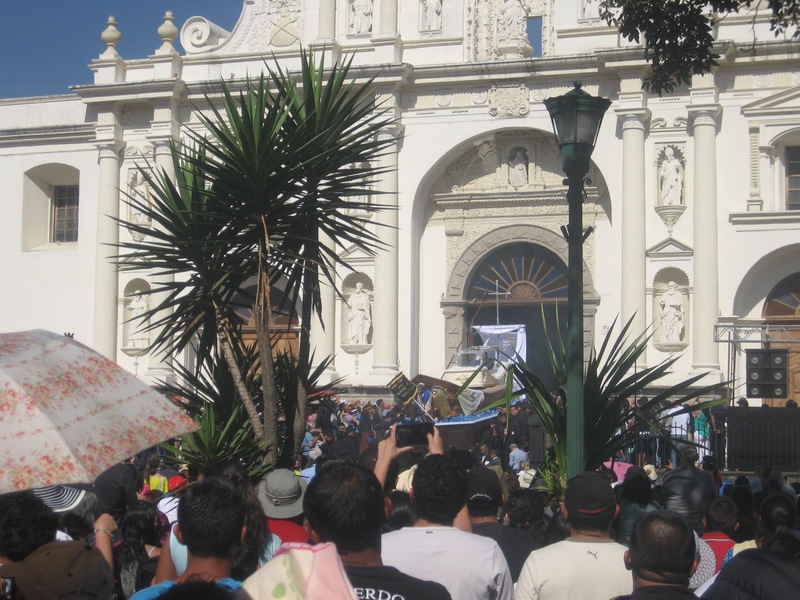 At midday Jesus’ death is reenacted in the cathedral and then his corpse is carried throughout the city in multiple massive funeral processions until the dark of night. Jesus’ body being borne out of the cathedral on a boat with a while sail. 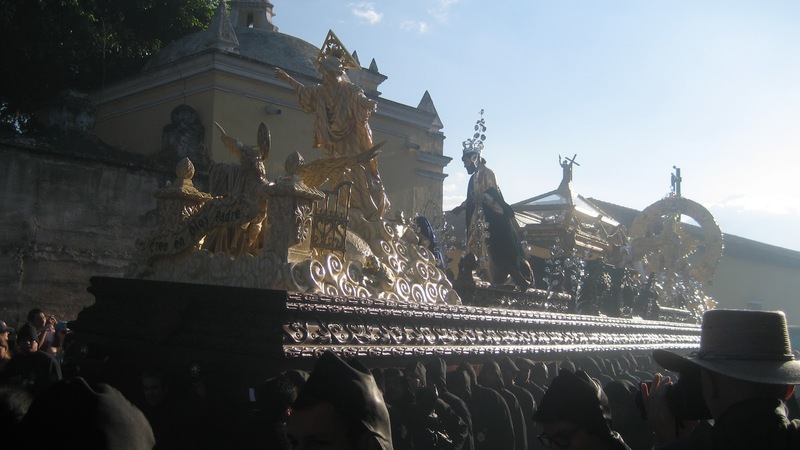 Another funeral procession, this time Jesus’ body is locked away in a coffin reminiscent of Snow White and escorted by golden angels. A sea of black moves with the dead lord. 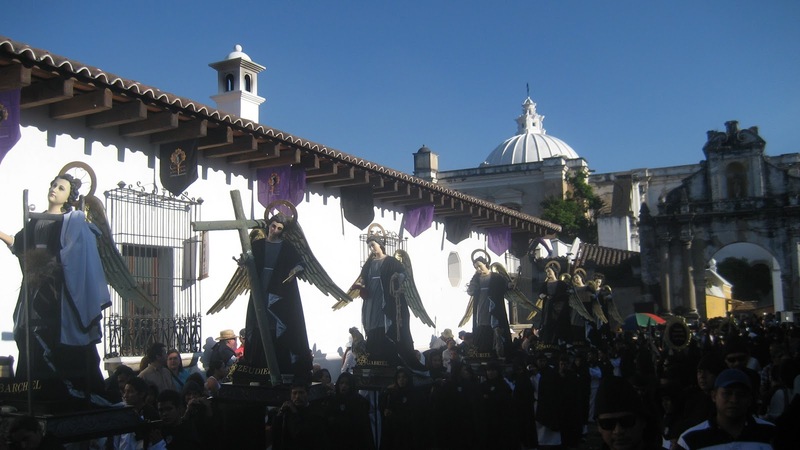 There are more processions on Good Friday than any other day by far–five–and they last longer–up to fourteen hours. You cannot help but find them seemingly everywhere you turn all day. 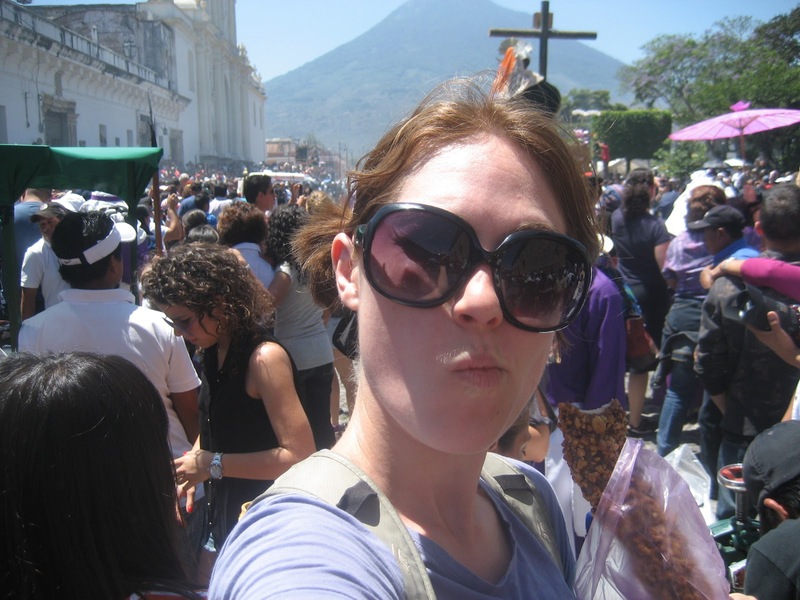 The crowds are also intense, and serious pickpocketing is a known danger. Nothing happened to me, but a woman in my dorm had her backpack slashed even though she kept it close. 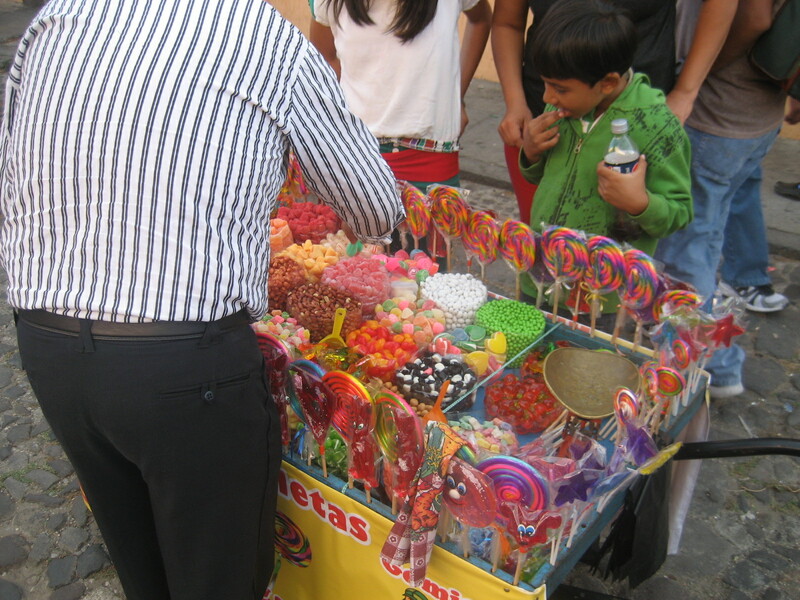 Gawking and keeping your wits is tough work, but luckily street food is everywhere, much of it sugary sweet: little glazed dough-nut balls, sugared fried stars, ice cream, frozen bananas, and of course candy carts. But what if I don’t want a regular banana later? The final Good Friday procession passed right by my hostel window on its way out of the city at 4am Saturday morning. They moved with as much devotion and volume as during the day. Bleary-eyed, I was drawn out of bed to the window to watch. I loved that it didn’t matter what time it was; this procession was the most important thing happening in the whole city and trumped anyone trying to sleep. If only! Way better than cockroaches (oof, in my last dorm bed!). When I turn on the light a bunch of koala bears scatter. And I don't want them to, you know, I'm like, Hey, wait, come back. Let me *hold* one of you… feed you a leaf. Heart.